People who have never dealt with anxiety cannot understand what it is. Sadly, high-functioning anxiety is even harder to understand. People who suffer from high-functioning anxiety are under stress, they panic, make plans, achieve, and tell people they are doing fine. But, the sad truth is that in reality, these people are drowning. They grind their teeth, bite their nails, and they just want to get through the day. Sometimes, the things are more serious, so they pull their strands of hair, skip meals and count calories, and cancel plans at the very last minute. Even though these behaviors may not seem like high-functioning anxiety, they are. People experience serious panic attacks that may even take their breath away. So, this results in chest pain that reminds of a heart attack, full-body chills, and sweaty hands. Also, they may not experience any symptom, but still feel like the world is closing in around them. They put a smile on their face, and move on. No matter what is going on, they continue to achieve, as if the praise is the cure for their problem. They become responsible for their work, a team captain, and they try to get a promotion at work. Their grades are excellent, and they have great review and report card. They keep these things as if they were their armor because they prove that besides the anxiety, they are good enough. However, besides the achievements, anxiety finds its way to attack. Every victory is bringing more pressure. These people often ask themselves questions such as: “What if I do not make the deadline? What if I say something wrong?” Also, they are worried that they may be the reason if something turns wrong. And, since they believe that they are not good enough, they wonder how long will people take to realize that. Living with a high-functioning anxiety is not easy. Sometimes, when they see someone with a warm smile, they believe that smile is because the person is working against them. When they do not get an answer to a text message, they believe that is something serious, that the world is falling apart. When people give them compliments, they do not enjoy them, but they begin examining them because they believe the compliment is insincere. Due to their effort to appear that they are doing just fine, these people may withdraw from their friends. When the people who are close to them notice that there is something wrong going on, they are not sure what. Often, people label them as stressed or busy because after all, they are keeping up with work, getting great grades, and succeeding at work. They have no idea that people with high-functioning anxiety are just afraid to stop, that is why they keep going. They are not living a life, they are just good at faking it. They smile, dance, sing, and laugh, and the world believes that they are doing well. And, to ask for help, is not an easy thing to do. In fact, it is extremely difficult. 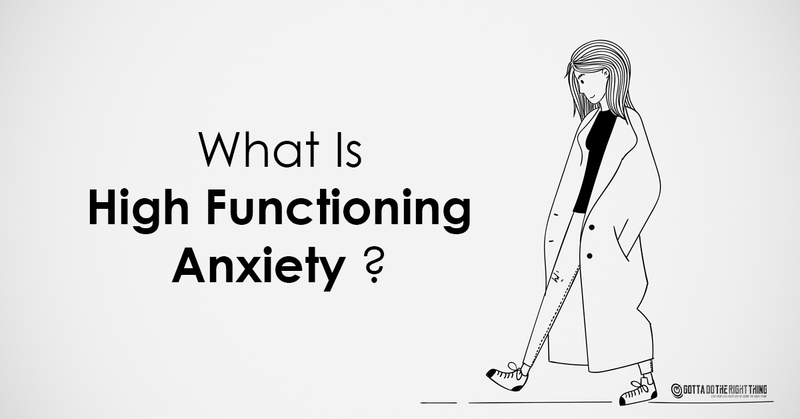 If you are a person with high-functioning anxiety, you need to know that you deserve a real happy life. You need to try to feel better, and you should never give up on yourself no matter how hard things are. There are many things that can help you, such as talk therapy, meditation, group support, verbal affirmations, art therapy etc. Choose whatever suits you best, and work on yourself. Remember that you are a very strong person who deserves to be happy.